High power flexible heating jacket - ideal for heating of liquids and melting of some solids. The outer surfaces can be touched safely without the need for special handling.Flexible heating jacket for applications requiring a high performance, low cost solution. The jacket is for general industrial use where price is a critical part of the decision. 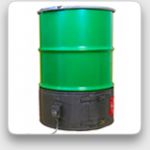 Designed for standard 210 litre drums, this heating jacket delivers 750 watts of power. Excellent performance in the heating of liquids and melting of some solids has been shown at a price point normally associated with energy hungry silicone band heaters. Due to the high grade, high density insulation incorporated as standard, the outer surfaces can be touched safely without the need for special handling. A single HHND heating jacket may be used for heating liquids and melting some solids. Two or three heating jackets combined, will increase the heating rate and allow more difficult solids to be melted.